Solar energy and solar energy technology have seen an unprecedented rise over the past decades, and especially in the past few years. Not only are there numerous commercial and industrial solar power plants providing electricity to homes, there are also personal solar panels which everyone can install on their own home and produce their own electricity from this great renewable and inexhaustible source. If you are considering installing solar panels on your own home, the first thing you will likely want to ask is how many panels you will need. The simplest answer is – it depends. The best option is to contact a solar panel contractor like https://actionsolar.net/ and have them give you an estimate. Why Are You Installing Solar Panels? Before you can figure out how many panels you will need, there are a few questions you will need to get straight with yourself. First of all, what is your goal? Are you trying to help save the planet? Or are you looking to save money in the mid and long run? There are people who install these panels in order to increase the resale value of their home down the line. The most likely answer is that it is the combination of all of these goals. However, even when your motivation is clear, there are still other factors which you will need to account for. Below is a list of the most common questions you will be asked by a solar energy contractor. How Much Electricity Do You Want? First of all, you will need to determine whether you want to use solar panels as an additional source of energy or if you want them to cover your entire electrical bill. Whatever the case is, you need to know how much electricity you use each month. This information is available on your previous electricity bills. The electricity consumption likely varies from month to month, but you can get the general feel of how much electricity you use. The most likely position for solar panels is the roof. It is in an elevated position and it will gather as much sun as possible. However, not all roofs are equal either. The position and the shape of your roof will have a major impact on the number of panels you can feasibly mount on your roof. The best roof shapes for solar panels are simple gable roofs since they offer the largest continuous area for solar panels. Another Important aspect of your roof is the positioning. The optimal position for solar panels is one which gets plenty of sun exposure in the afternoon, so west-oriented roofs are the best, but experts say that there are some other orientations which can be worked with as well. How Much Sun Is Your Area Getting? 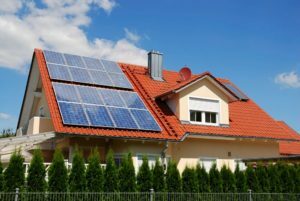 Even though solar panels can be effective pretty much anywhere where the sun shines, there are some areas which will simply yield better results. The primary factor which determines effectiveness is the amount of sunlight per day/month/year. There are price and quality differences between different panels. The most common type of panels are the PV (photovoltaic panels) and they range from 150 to 370 watts, which means that the total number of panels will depend on the final output that you are looking to achieve. The size of your panels will be important as well, since bigger panels tend to have bigger useful area and are more suitable for roofs with large areas which are useful for solar energy. However, these solar panels are most commonly less efficient. On the other hand, smaller solar panels have much less useful surface, but tend to be more efficient, which makes them ideal for roofs which only have a small area to use for solar power. Installing solar panels on your home is one of the ways you can help protect the planet all the while saving you some money through your electricity bill and likely tax rebates you will be entitled to as an energy-efficient household. The decision to go forward with solar panels has never been easier.